The ZuneOne leather case ($15 USD) is a folio-style case with a magnetic closure mechanism and a rotating leather belt clip on the back. The magnetic closure feels very "Zune" (in line with other accessories like the headphones and car pack v2). While the overall construction is solid and has held up under a good deal of almost continual punishment, the stitching between the back of the case and the belt clip feels weak, and several of the seams started to open up after only a few weeks of normal usage. Additionally, the cutouts for the play/pause and back buttons are quite hard to get at, though both the screen and d-pad benefit from their generously-sized holes. The top flap has a hole cut out for straight plug headphones and there is space on the top sides for right-angle plugs too. You will have to flip open the case to operate the hold switch, but the flap basically negates the use of the hold switch anyway. The bottom of the case features plenty of room for a cable connector, but as with most cases, the Zune/case combo will not fit in a dock. If you're in the market for an inexpensive yet still stylish and durable leather case, you can do a lot worse than the ZuneOne. 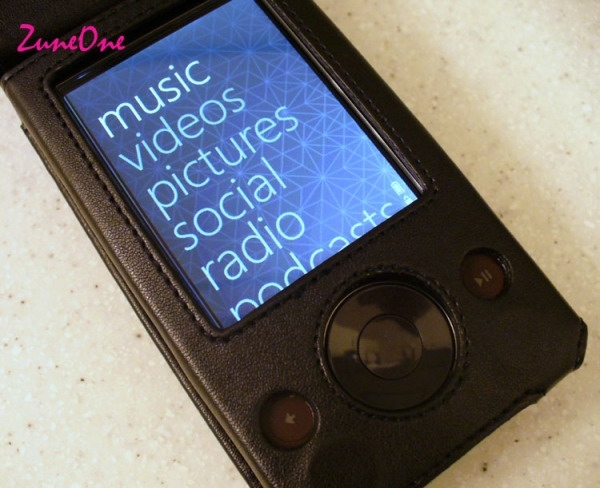 Adam Krebs is an avid Zune fan whose brown 30 has weathered every firmware update since 1.0, and attributes this fact to the excellent protection he provides his device. He lives in Cambridge, Massachusetts with his family.